September 14, 2016 August 31, 2016 / J.K.
*Please ignore the Dr. Oz endorsement on the cover. The book is a really interesting look at lifestyle and does not offer magic pills or tonics to purchase. 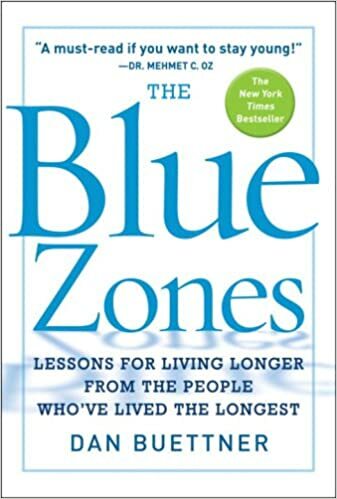 Blue zones, so named because while researching the first one, a blue circle was drawn around they area under discussion, are areas in the world where people live the longest. Not only do they live longer, but live better as centenarians (100 year olds) then many people much younger do in other parts of the world. The book takes us through the four blue zones, and shares interviews, history, diets and other fact about the life of the people who live there. The four blue zones are – Sardinia, Okinawa, Loma Linda (California) and Costa Rica. They have since discovered another one in Greece. Move Naturally – Everyone studied for the book was extremely active. They walked miles a day, gardened, etc. His point is no one has to run marathons or become powerlifter, you just need to move often. Hara Hachi Bu – A phrase said by the Okinawans before every meal reminding them to eat until they feel 80% full. Calorie restriction has been shown to be very important in longevity. Plant Slant – With the exception of the Adventist in Loma Linda, no one was a vegetarian. However, they all ate meet rarely, anything from once a week to only a few times a year. Grapes of Life – Wine. It plays a big role for the Sardinians and the Okinawans drink Sake, but the others consumed no alcohol. Either way, studies have shown a drink or two a day, especially of wine is beneficial to your health. Purpose Now – Having a sense of purpose, or a reason to get up in the morning, something that drives you. Down Shift – taking time to relax, meditate or slow down and enjoy life. Belong –To a community, but a part of something bigger than yourself. Religious communities, regardless of which one, have been shown to help people live longer. Loved Ones First – Relatedly, take time to cultivate relationships and spend time with friends and family. Prioritizing social life is something we really fail at in America. Right Tribe – People who share common goals and healthy lifestyle. Many studies have shown that who you hang out with has a huge impact on your lifestyle. Have an obese friend increases your chances of becoming overweight. Seek people who have the same above traits in mind. Things like this are utterly fascinating to me. Both of my granddads are currently 91 years old and show only a few signs of stopping. Much of their life has included most of the traits. Modern America has us moving further and further away from these things. We eat lots of cheap, processed food. We don’t spend much time with friends or family. We do not rest often. We don’t move. I’m currently writing this at my desk, I spend far too many hours a day sitting at a desk and wondering how I can move. Adopting as much of the Blue Zone lifestyle will not only help you to live longer, but the time you do spend will be better and healthier.